Water security is a growing concern in Vietnam, particularly in drought-affected provinces. Most recently the 2015 -2016 El Nino drought and associated saltwater intrusion affected some 400,000 ha. of cropland to varying degrees of productivity loss. Urban and rural water supplies were also significantly impaired resulting in around 2 million people lacking access to water in 2015. In response, the Government is taking active measures to improve water use efficiency and water productivity, especially focusing on the agriculture sector since it consumes the bulk of surface and groundwater. The outcome of the Project is climate resilient and modernised irrigation systems providing flexible and affordable services to beneficiary farmers in the five participating provinces. From 20 – 29 October 2017, AWP provided key government representatives from Vietnam practical examples of a modern piped supply system (and its operations and maintenance) for High Value Crops. 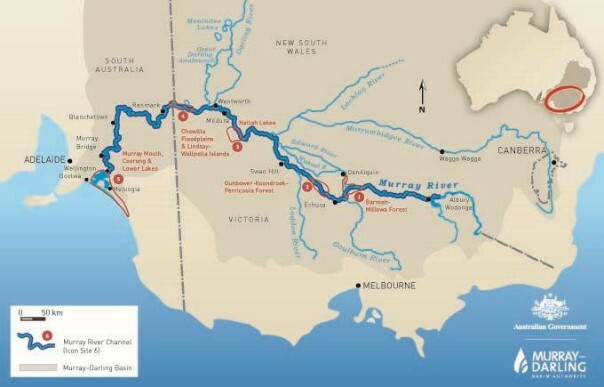 The study tour visited parts of the Murray-Darling Basin, as shown on the map below. The tour started in Adelaide with a workshop and travelled to Renmark and Mildura by bus before flying from Mildura to Sydney for the last workshop. The tour visited a very small portion of the basin and ill concentrate on the lower sections around the border of the 3 main states, i.e. NSW, Victoria and SA. The Chair of AWP Advisory Committee, Kaye Schofield (AO) met with participants in Sydney at the final dinner and Roch Cheroux (AWP Advisory Committee Member and CEO of SA Water Corporation) welcomed participants in Adelaide. Rob Rendell from RMCG coordinated the technical aspects of the tour and accompanied participants. The logistics of the tour was managed by Australian Water Association (AWA) who have extensive involvement in urban and rural water supply within Vietnam and Ms An Nguyen from AWA served as the interpreter for the study tour. For more information, please refer to the WEIDAP study tour program 2017.